DIN Standards are issued for a variety of components including industrial fasteners as DIN 963 Slotted Drive Flat Countersunk Head Machine Screws. 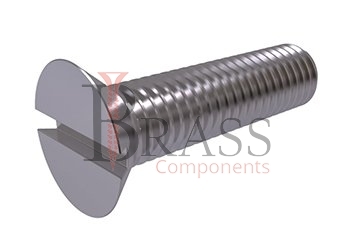 DIN 963 Screws are manufactured from stainless steel Grade A2 and A4, Brass, Carbon Steel or many other materials. DIN 963 Screws are available in a wide range of sizes, shapes and materials. DIN 963 Screws with a Countersunk head and a straight slot. Complies with GOST R50403-92, GOST 17475-80, ISO 10642 and UNI 5933. Slotted Drive Flat Countersunk Head Machine Screws. Available in Zinc Plated Steel as well as stainless steel A2 and A4. The slotted recess has a deeper milling slot to ensure a better screwing and grip. DIN 963 Screws are partially or fully annealed as required. DIN 963 Screws are usually threaded with machine threads and blunt point. 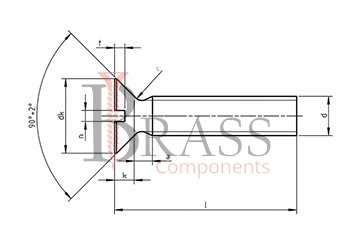 The recommended pre-drilled hole sizes vary depending on the diameter of the screw to be used but should be slightly larger in diameter than the major thread diameter. Machine Screws form a fastening superior in strength to space thread screws. Metric Screws are the type almost exclusively used in items manufactured in Europe. Resistant to many organic acids. Designed for Metal to Metal Applications requiring a pre-drilled hole and a mating metric nut for the screw to thread into. Used in application where the head must be flush with the mating surface of the substrate. Ideal for screw connections in the machine area. Ideal fastening elements for optically sophisticated applications that require a high stability and hardness. Suitable for use under the most extreme atmospheric conditions. We manufacture DIN 963 Screws as per Custom Specification and export in France, Italy, Switzerland, Poland, Greece, UK and other European Countries. For more Information, Please Contact Us or Inquiry Now.